Jameson Crested Irish Whiskey is a popular Irish Whiskey available from TheDrinkShop in 70cl to buy online. Visit TheDrinkShop for the best price for 70cl of Jameson Crested Irish Whiskey or compare prices on our other Irish Whiskey products. A tribute to the oldest product bottles by Jameson. An accessible and scalable super premium from Jameson. For those who love the smooth taste of Jameson, but want to experience more of the brands rich history and treat themselves. Increased pot still content. Vivid Sherry, hearty pot still, some spice and a hint of melon and ginger. Full bodied with soft delicate undertones, toasted wood, perfectly balanced with fruit, spice and some chocolate notes, a warm embrace. 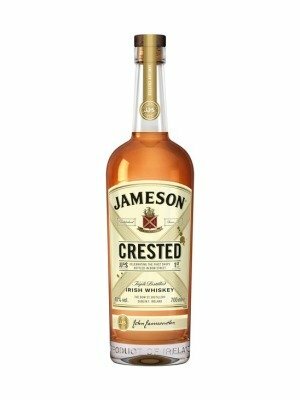 Where to buy Jameson Crested Irish Whiskey ? Jameson Crested Irish Whiskey Supermarkets & Stockists. You can buy Jameson Crested Irish Whiskey online in most retailers and find it in the Irish Whiskey aisle in supermarkets but we found the best deals online for Jameson Crested Irish Whiskey in TheDrinkShop, Amazon.co.uk, DrinkSupermarket.com, and others. Compare the current price of Jameson Crested Irish Whiskey in 70cl size in the table of offers below. Simply click on the button to order Jameson Crested Irish Whiskey online now.